The schoolchildren crowded in closer, intently watching the cards. Robbie scribbled a few more symbols, then held them up for all to see. “What does this say?” he asked. The children mouthed the sounds silently, some raising their fingers to make the signs to help them remember. “O’o!” they shouted in unison. “Right, now let’s try another one...” and Robbie began to shuffle a few more cards. The children grinned to each other—they were reading, and it was fun! Robbie Petterson is pioneering the use of Uniskript in the Gulf Province to write down the local languages. 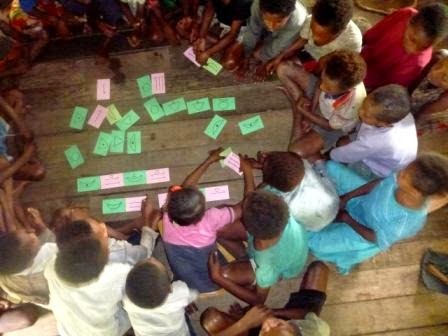 Originally developed by YWAM (Youth With a Mission) to assist in literacy in developing countries, Uniskript is a phonics-based teaching method that creates a pictorial and familiar bridge into the strange world of reading. In 2013, Robbie and Debbie Petterson, along with Gulf Province teachers Roy, Nelson, Anna, and Esther travelled to YWAM’s school in Hawai’i for several weeks to learn how to teach Uniskript in Papua New Guinea. This past August, I, along with several other teammates, joined Robbie and Debbie in 3-week trip around Gulf Province, helping teach Uniskript and encourage local classrooms in many different villages. For many children in oral-based cultures, reading is a new and difficult concept, and the letters found in traditional Roman script (such as the English alphabet) have no meaning or connection to their daily life. Uniskript uses pictograms or icons of familiar, cultural shapes, such as arrows, fish nets, crab hooks and shells, to depict the way the mouth works when creating sounds. Illogical spelling, which is often a barrier to reading well, is no longer an issue, because the children can easily sound out words. Reading becomes enjoyable and accessible, rather than an insurmountable mountain, and later, students can more easily transition to Roman script. 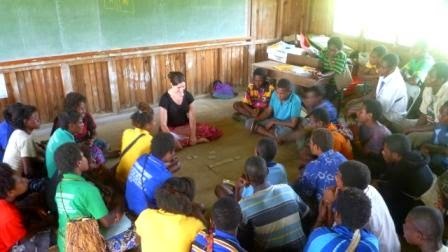 After watching and learning from Robbie, I thoroughly enjoyed working with a group of students in Akoma village, using the Koriki Uniskript to encourage them in reading. The kids caught on quickly (even though I didn't know the language) and by the end, were easily reading and putting together simple sentences. How does it work? Wander over to a mirror (or find a friend) and say the first vowel sounds of “ee” in “eat.” Repeat. Watch your mouth. Now say the “ae” sound in “ate.” Say “ee.” Now say “ae.” Which sound makes your mouth bigger? If you don’t know, say them again. You’re right—“ae” is bigger! Now point one of your fingers and hold it over your mouth while you say “ee.” See how it covers your teeth? Now say “ae.” The one finger isn’t enough anymore—you need two pointed fingers to cover your teeth. We can translate this into symbols. To make the sound “ae” we need two fingers. So, let’s use two akora. And so, we can progress through all the sounds in their alphabet, teaching the kids to become aware of how they make sounds and how they blend together. We played matching games and relays and jumping games and races, until learning became fun and the sounds made sense. Some kids who had been introduced to the system earlier were already reading some books produced in Uniskript. This then makes the transition to Roman letters much easier, because the concepts of using books, of linking sounds to symbols, of the messages hidden in sentences are already present. It's like playing with hieroglyphics! Did you know that September 8th is International Literacy Day? 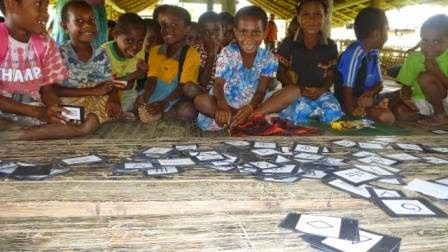 The literacy rates in Gulf Province are historically quite low, but this year, PNG's National Literacy Week is focused on this part of the country. 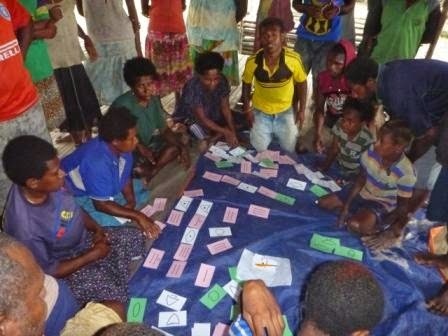 This week, educators from all over PNG are gathering in Gulf to celebrate literacy and draw attention to literacy needs throughout the country. Robbie and Debbie are hoping to share about Uniskript and continue to test its effectiveness in local schools.